B&B Micro Manufacturing Partners With General Contractors and Local Construction Companies To Make Safe, Durable Tiny Houses Available Across The Country. Trusted general contractors and local construction companies are in a unique position to sell tiny houses. Most experienced contractors have the skills and equipment to take on a tiny house build, but few have taken on the task of building a small, liveable space on a trailer. B&B Micro Manufacturing provides local contractors and construction companies with exclusive pricing on weather tight tiny house shells (wood or steel framed) on trailers and tiny house frames (wood or steel) on trailers. All of our products come with a certificate of origin for licensing and registration purposes. White Label Our Tiny House Shells and Frames For Ultimate Brand Consistency. B&B Micro Manufacturing provides an opportunity for general contractors and construction companies to sell our tiny house shells and frames on trailers as white label products. How does it work? Discuss needs and budget requirements with the client and determine initial design specs and layout guidelines. We can involved in the design process as much or as little as you like! Order a tiny house shell or frame at a discounted rate. A frame is just that – a frame on a trailer – and it can be steel or wood. A shell comes constructed and sheathed with walls, a roof, and a sub floor. B&B Micro Manufacturing builds the frame or shell on a trailer to your specifications (or based on a standard model) and delivers it. You get to complete the build with unlimited design flexibility and deliver a product with your name on it, knowing that your work is built on a strong, sturdy, durable and reliable foundation. Work With A Leader In The Tiny House Industry To Add New Revenue Streams To Your Business. 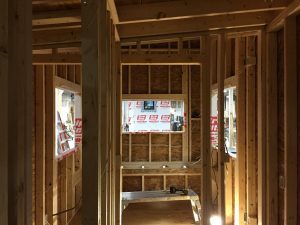 Reselling our tiny house shells and frames is a simple way for established construction businesses and contractors to add additional revenue to their bottom line. Benefit from partnering with an industry leader to deliver high end tiny houses to your clients, with your company name on them. Ready To Get Started Selling Tiny House Shells and Frames?